24 hour Edinburgh locksmiths service covering all of the Lothian area. This is a local mobile locksmith service operating seven days a week. Fast, friendly and reliable- Richard is always on hand whether it be an emergency lock out situation or routine door repairs/ lock changes or upgrades. 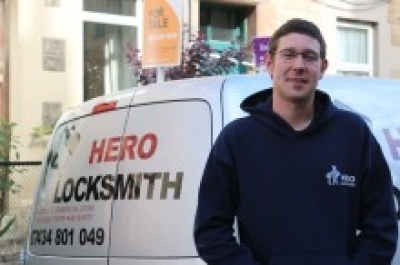 Being a sole trader, Hero locksmith is an easy to use company, one person to deal with all the way. No trainees sent to your property and no call centres to pass on the wrong info. No call out charges, and all prices will be agreed before work is undertaken. Based in south Edinburgh making all of the surrounding areas of Penicuik, Bonnyrigg, Dalkeith and Musselburgh only a short distance away. Typically arriving in 30 mins or less, if it's an emergency locksmith service you need, you won't be out in the cold for long. Call Richard any time for quotes or even security advice.